The services and accommodations are A one at "Hog Wild" I will be telling all back in Minnesota, to get out of the 20 below zero weather and warm up at Hog Wild. We have hunted Hog Wild twice now, both times we have really enjoyed our stay. Accommodations are great, guides are always willing to go out of their way to ensure successful hunt. They are now adding more accommodations that will make your stay even better. We’ll be back! A great place to hunt, top-notch room and board. Well worth the drive from Kansas. My second trip here in the past 2 years and a took home a pig both years. Personal guides do a great job, they want you to enjoy your visit and be successful. My family and friends have been to Hog Wild several times. We've had success with guns, archery and my personal favorite, hunting with dogs. We have recommended Hog Wild to other friends who have taken their family and friends and I have yet to have or hear a negative word about Hog Wild. Matt is a great guy who has become a great friend. The same can be said for Brandi and Cody. Top notch hunting with great people. What more could you ask for? Your place is incredible. We stayed onsite and had a fantastic time. Cadan and Matt did an excellent job. Not just great guides but great people. Four in our hunting party with four pigs in our truck! 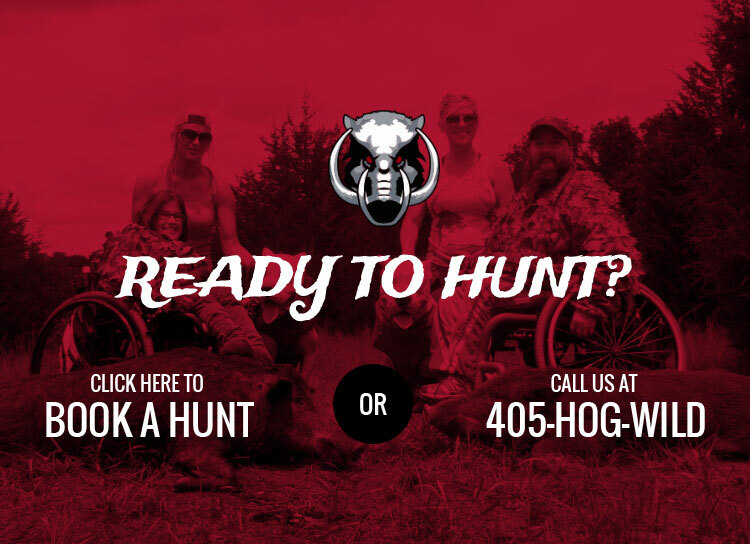 I appreciate Wild Hog OK service and services. Can't wait to get some exotic animals. Just wanted to drop you a note to let you know what a great time I had down at Hog Wild last week. Matt went out of his way to make sure I was able to get a hog. You can be sure I will be back next year. Thank you again, and I will see you up at the Iowa Deer Classic. I had the most fantastic trip with my boys to Hog Wild of Oklahoma. Guide, Matt was a superb friend to my kids and great guide. He got us on target. Not always a shot, but certainly an opportunity. If you desire a chance of getting some wild pigs and having a great experience, I recommend Hog Wild. This had to be one of the best hunts I have ever been on. Matt was an awesome guide, and did everything to help me get a hog. If you don't get a hog on their place, it's not their fault, you're just a lousy shot. We saw an amazing amount of game. I will definitely be back! Matt was the most wonderful host, ensuring myself and my clients had the best experience. Highly recommend Hog Wild for anyone looking for a quality hunt with very professional people.